It’s that time of year when weddings start to slow down but businesses pick up! We are extending low season savings onto small businesses who have great ideas but don’t have the resources to bring them to fruition. We can help make it happen through story or through a short promotional film. Check out our two business options below and get in touch with us to tell us about your idea! Travel fee’s outside of the greater Saint John area are subject to additional costs. Music (business license) is not included in the posted price. Limited availabity. Unlimited creativity. Get in touch with us and we can discuss your promo film or short story. This promotion is only offered from Dec 1st, 2014 – Feb 28th, 2015. 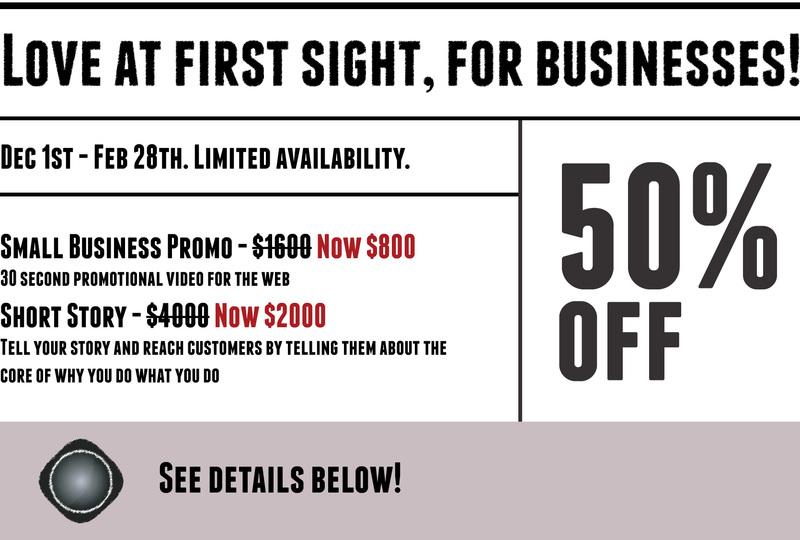 We are offering this to the first 3 businesses who confirm bookings. Coffee is on us! [FREE UPGRADE] If you’re interested in this promotion and have a Facebook page, you can sweeten the pot a bit more. All you need to do is like & share our Facebook post about this promotion on your company’s Facebook wall. Help spread the word and your company will be eligible for a upgrade to “UNLIMITED EDITS”. Yes, that means we will edit your promo film or short story until you’re absolutely thrilled with the result. We are a visual audience online, and if you’re not marketing yourself to the way people are engaging, then you’re simply missing out.